In Indonesian Cuisine, Dendeng means thinly sliced dried meat. 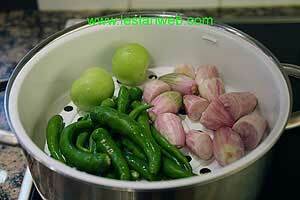 It is preserved through mixture spices or sugar and drying through frying process. 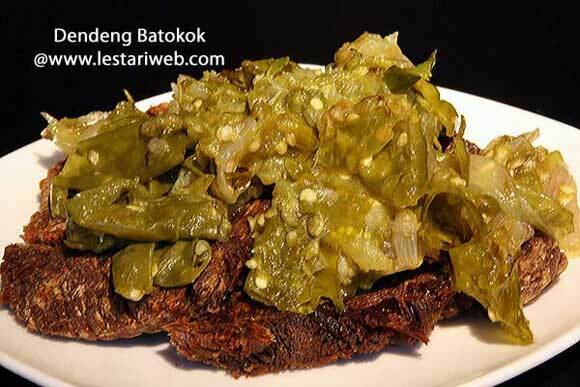 Dendeng in West Sumatra culinary repertoire is very different from it's Java counterpart, for example "Gepuk Sunda" from West Java or "Dendeng Ragi" from Midle of Java Region. In Java, dendeng is soft and generally taste sweet. While in Sumatra is often spicy marinated, has hard & thinly texture which comes from heating process. Dendeng is originally invented by Minangkabau people. In it's homeland, West Sumatra, the drying process is obtained by drying it directly under the sun !!. History suggested, they made it dry so it can be preserved & eaten for days and bring it anytime for a long journey away from home. 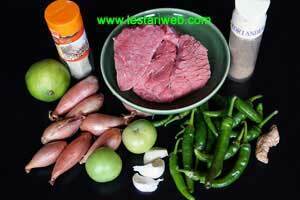 Making Dried Beef: Cut the beef in half to fasten cooking process. Set aside. Put all ingredients for the paste in grinding stone or food processor and grind/blend until smooth. If necessery add a little bit water into the food processor to help the blending process). Rub the paste all over the beef and let aside for 15 minutes. Boil the coconut water or normal water. Add the beef & cook until the meat getting tender & the water is driven off. If available, use the pressure cooker. Cook for 20 minutes since the pressure cooker begins to sizzle. 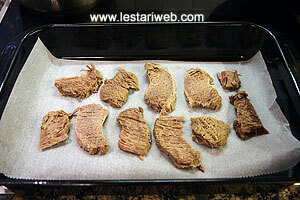 Take out the beef, cut in 1 cm thickness lengthwise along the meat's fiber. 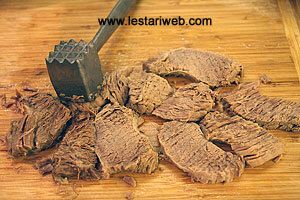 Pound the meat with a meat tenderizer/mallet until soft and tender. Avoid breaking the meat into pieces. 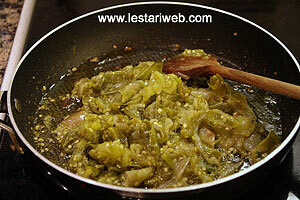 Making Green Sambal: Steam the green chillies, shallots & tomatoes until half cooked (approx. 5 minutes). 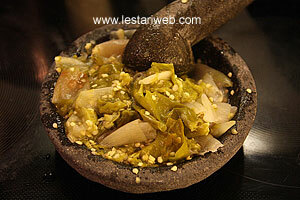 Put the ingredients in a grinding stone/blender & grind/blend coarsely. You can grind the aboved ingredients whithout pre-steaming, especially when large grinding stome & pestle are available. Heat 1 tbsp oil in a frying pan and stir fry the sambal. Stirring all the time until fragrant. Add the salt to taste. Add the lime juice, gently mix & remove from heat. Serving Method: Arrange the dried beef on a serving plate, pour the sambal over it. Serve with rice and blanched vegetables.